In our LAUNCH program, participants use state-of-the-art research and technology and work with WPI’s renowned faculty to find solutions to current problems in a variety of scientific fields. There is the option to attend LAUNCH during the day as a commuter student, or stay overnight on WPI’s campus as a residential student. Participants will explore the use of technology to identify and solve problems in our community. Blending entrepreneurial and computer science concepts, course staff will guide participants through a rapid development life cycle from launch to pitch. Participants will prototype an app, explore design and programming approaches, and present their ideas to a group. This program focuses on the study of soil ecology and the microscopic creatures that inhabit our environment. Participants become part of the scientific community by contributing their findings to databases of information gathered by people across the country. At the end of the week, participants’ families are invited to campus to have homemade liquid nitrogen ice cream, and enjoy a presentation of the discoveries made. Explore the world from the point of view of atoms to learn how we covert energy from sunlight, store energy in chemical bonds, and release energy back into the wild. You will think about how we use chemistry every day, learn how material properties impact our lives, and control atoms and bonds to make new materials with new properties that have yet to be discovered! Do you have a natural curiosity about the world around you? Would you like to help contribute to scientific research from as close as your own backyard? In this course you will become a Citizen Scientist and explore ways that you can make an impact on a local, national, and/or global scale through observation, data collection, and an intent to make the environment in which we live a better place. Participants are able to explore multiple areas of computer science, and select their own path by completing several self-paced tutorial modules. Course staff provides education on programming basics, which participants apply to a project such as a creating a cloud platform based personal webpage. Cybersecurity is at the forefront of contemporary issues for computer systems. In this workshop, participants will have the opportunity for significant hands on experiences with topics such as Web-App security, network security, forensics, system security, cryptography and privacy. Participants will use appropriate tools and may include programming for analysis of data. Circuits, circuits, circuits! Everything that uses electricity from your smart phone to electric cars and robots relies on the concept of a simple circuit in order to function. In this beginning electrical engineering course, you will explore the basic concepts of circuits, learn the physics behind circuits, and use state of the art technology to design, build and test your own devices. Through computer modeling, online simulations and hands-on games, participants explore the concept of sustainability, and gain a new perspective on some of today’s toughest environmental issues. Some topics that are covered include natural resource balance, regulating industries for sustainability, and the impact of the climate. From art to engine! This intense week of fun and learning will teach students how to create a character model, set it up for animation and import it into the Unreal game engine. Students will work in industry standard tools, modeling in Zbrush, rigging and animating in Maya and finally lighting and rendering in unreal. Students will be provided with completed assignments if they can’t reach their vision in time. But a special focus is placed on teaching them where to go when the class is over to continue their favorite part of the process. 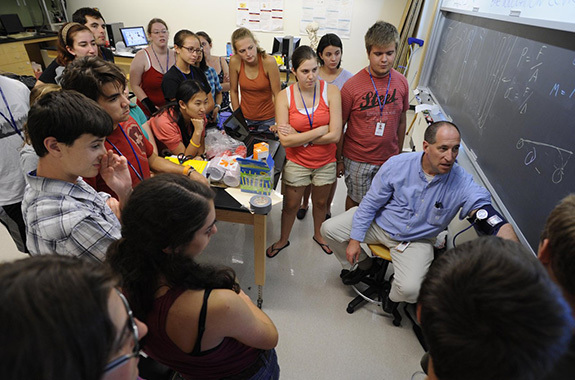 In this workshop, participants explore WPI's state-of-the-art manufacturing engineering laboratories as they learn about advanced automation techniques. Participants work hands-on with lab equipment to design and build components that will come together as a functional assembly by the end of the week. Through a combination of lectures, audio-visual presentations, hands-on laboratory experiments, and visits to research facilities, the foundations of Physics are explored. How we know what we know, especially when we don't even understand what we know will be the theme! Discover the science and technology of this exciting field. Participants learn about mechanical design, sensors, and programming by building designs using Vex robots. They then get the opportunity to program their creations using easyC. Challenging robotics problems will culminate in a competition between student groups at the end of the week. WPI reserves the right to cancel these tracks and reassign students to other tracks or refund your tuition.